I have a hard time reconciling the amount of time it takes to network online. I did it at the launching of my Hallee the Homemaker blog when Jeb was a nursing baby, so it was a forced down time. It also happened to be my computer time with Gregg while he was in Afghanistan. Around noon my time, he’d be in his room getting ready for bed. So, we’d talk and I’d network. Now, though, I’m sitting with the boys running around fighting with light sabers, bread is rising, laundry is washing, and a turkey is cooking in the roaster. I have to force this time on the computer — because there are so many other things around me that require my attention. That stopped me. How could he be out of white T-shirts? I looked, and sure enough, there were none there. I went down to the laundry room to see if I’d left a basket of laundry unfolded, and did not find anything. Further inspection revealed that the boys were out of white socks. They have a dozen pair of socks a piece – easy – and had none clean? I was horrified. It got me looking around. The refrigerator is quite empty. Not that there’s no food in there, but usually, my fridge is so full you have to dig through it to find anything. Right now, half the shelves are empty. I haven’t done any serious produce/dairy grocery shopping in over a week. I keep putting it off, thinking that I’ll go the next time I’m out. This morning, the boys ate cold (organic) cereal for breakfast, Gregg had a smoothie, and Kaylee ate an apple and a protein bar. I don’t even know what I had on the menu for breakfast. I realized I hadn’t tended to my sourdough starter in a couple of days and it was totally ruined. I had to dump it out. These things are very minor and may not seem like big deals, but they are huge deals to me. This household runs like clockwork. It is important to me that it does – and the reasons for that are twofold. One, it’s my job. It is. I’m Hallee the Homemaker, and running this home is my job. Two, I function better with order. I like schedules, I thrive with lists, and I need to get done the things that I need to get done one the days I’m supposed to be getting them done. It’s not like I’m only working on networking and books and ignoring my children and my house, but I’m taking shortcuts. I have bread going in a bread machine right now. I made it for the first time in the machine a few weeks ago and asked the family what they thought of it. “It’s really good, but it’s not ‘Mommy Bread’,” — which is what they’ve titled my Whole Wheat Honey Oatmeal Bread. “This bread works, but ‘Mommy Bread’ is so much better.” I thought, okay — I’ll just not make this bread anymore and I’ll stick with the original ‘Mommy Bread.’ And yet, this morning, when I saw the heel of bread that was left, and I thought about all of the things I needed to do today, I threw all of the ingredients into the bread machine and hit ‘go’. I’m doing laundry, folding laundry, ironing laundry, putting laundry away — but when I go to put a load of clothes in, I’m not washing the white T-shirts and white socks that get washed in bleach, because that load takes much longer to fold. So, I skip it and put in a different load, thinking that tomorrow I’ll have more time. For hours and hours a day, I’m building characters, scenes, and developing story lines in three 75,000 word novels that will release over the next three months, all while trying to build a web presence as someone other than the person to go to when you need to know how to make homemade fabric softener. I’m also working the homemaking blog and trying to maintain that web presence. I LOVE it. I totally love this new focus on my life. Obviously, though, something needs to change. 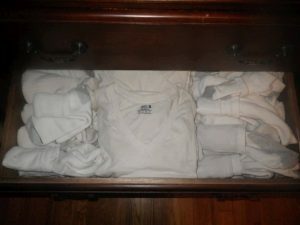 I realized, when I looked at that empty drawer where the white T-shirts go, that I need to revamp my schedule. I need to recreate it so that this new venture will fit and that my home will continue to run as dependably as a clock. So that my family still gets homemade, fresh ingredients, whole food; so that my family can open a drawer and count on socks being clean and folded and put away; so that I can open the fridge and know that I have all of the ingredients I need to make whatever dish I want to make; so that someone can pop in out of the blue and I don’t have to be embarrassed by the mess the boys made in my living room. So that I can still write, blog, and network. I believe God has me doing this right now for a reason. If He has me doing it, He’ll have a way for me to do it. I intend to pay attention next week – write down what works in the schedule and what doesn’t. Then I’ll make it official, print it out, and stick to it. I used to do this – work a full time job with extracurricular activities and associations and run my home. I’m just out of that juggling practice. I look forward to putting it all into motion and sharing with you what works – so that we can help each other, teach each other, and lift each other up! This entry was posted in Blog and tagged Hallee the Homemaker, networking, scheduling. Bookmark the permalink. Get a housekeeper if possible to do the things that don’t matter to your philosophy…such as wash, grocery shopping..etc. Your daughter is more than old enough to help out (as I am sure she does) as are the boys. EVERYONE’s responsibilities in the house got upped when I started this venture. I’m still trying to organize how that will work, too. I think it’s better in the long run. I have a tendency to over micro-manage. This allows the kids to have more responsibility.